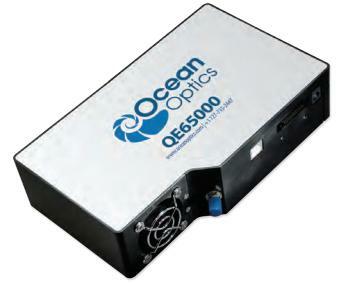 Ocean Optics offers a full range of spectrometers and systems for thousands of UV-Vis, NIR, Raman and other applications. 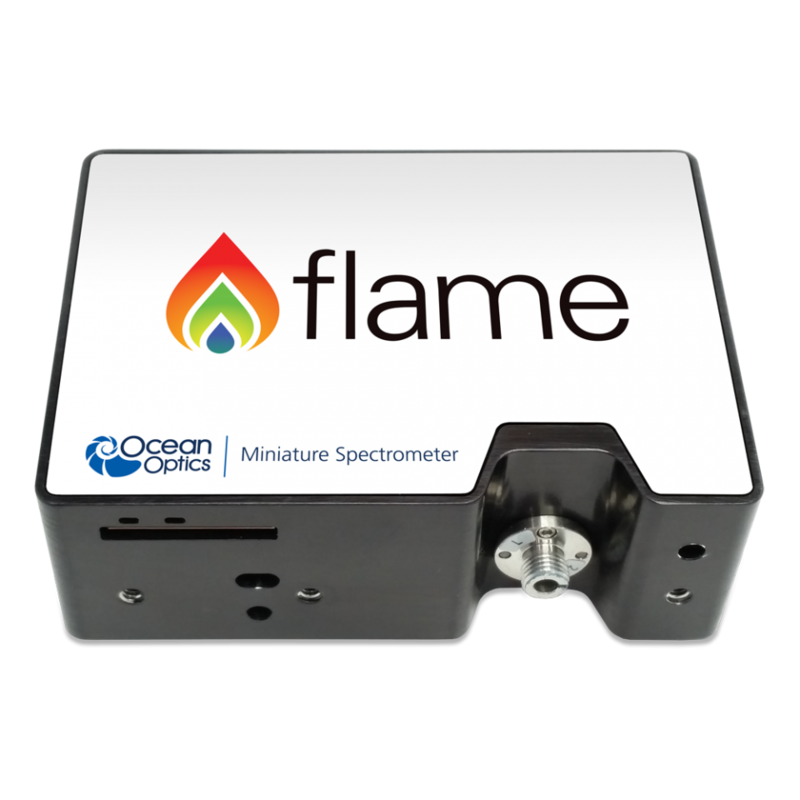 Ocean Optics spectrometers have traveled inside live volcanoes, have visited outer space, have aided in medical diagnostics and are used in educational curricula throughout the world. Whether your work is in the laboratory or classroom, in the field or on the process line, Ocean Optics has a spectrometer or system that helps you find your answer. 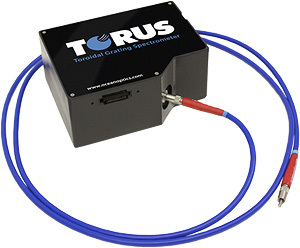 Torus is a family of aberration-corrected holographic concave diffraction grating spectrometers that delivers low stray light, high throughput and excellent thermal stability for a wide range of research and OEM applications. 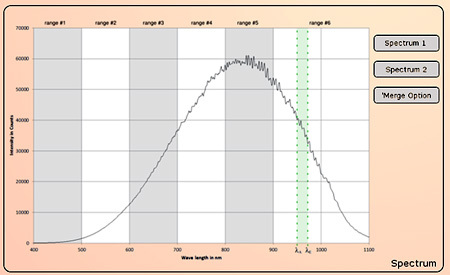 Our initial Torus model is a Visible range spectrometer (360-825 nm) whose spectral range and low stray light make it especially useful for measuring color. Its high throughput and great thermal stability make it ideal for demanding applications. spectroscopy software and then connecting the USB cable from the spectrometer to the computer. Wavelength calibration coefficients – unique to each spectrometer – are programmed into a memory chip right on the unit and the software reads these values from the spectrometer. 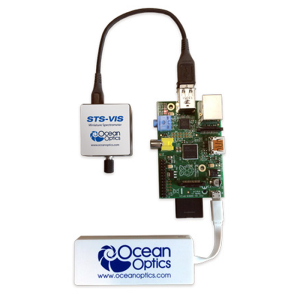 Ocean Optics USB-Series spectrometers are versatile performers for a wide array of applications. Although our flagship USB2000+ and USB4000 spectrometers have comparable electronics and architecture, they do have one very important difference: their linear CCD array detectors. 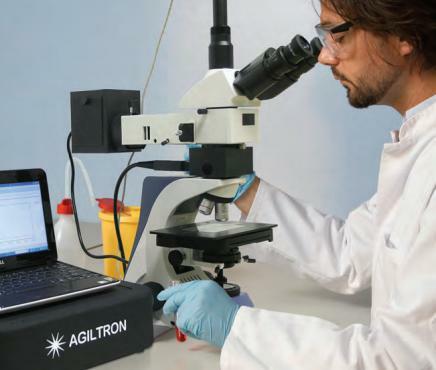 In addition, USB2000+ and USB4000 spectrometers are available in application-ready (preconfigured for specific application types) and build-your-own (user-configured for maximum flexibility) versions. The USB2000+ has a 2048-element Sony ILX511B detector and the USB4000 has the 3648-element Toshiba TCD1304AP detector. Both are linear silicon CCD arrays with an effective range of 200-1100 nm and are available with the same optical bench accessory options (quartz window for UV performance, order-sorting filters and so on). Our HR Series Spectrometers combine optics and electronics that are ideal for applications demanding high resolution and fast measurements. Popular for laser characterization, gas absorbance and emission line analysis, our HR Series Spectrometers are especially useful where rapid reactions need to be monitored. We offer two HR Series models, HR2000+ and HR4000, in both application-ready (preconfigured for specific application types) and build-your-own (user-configured for maximum flexibility) versions. 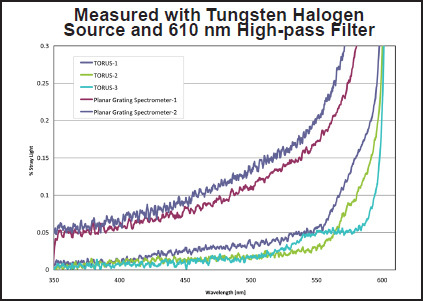 Also, the HR2000+ and HR4000 have comparable electronics and architecture, but different linear CCD array detectors. Our HR Optical Bench is responsive from 200-1100 nm and can be configured to address your application needs through customization of gratings, mirror coatings, detector window and aperture size. Its onboard A/D converter allows you to capture and transfer up to one full spectrum into memory every millisecond when interfaced via USB to your computer. The HR2000+ has a 2048-element Sony ILX511B detector and the HR4000 has the 3648-element Toshiba TCD1304AP detector. Both are linear silicon CCD arrays, with an effective range of 200-1100 nm, and are available with the same optical bench accessory options (quartz window for UV performance, order-sorting filters and so on). The HR2000+ has slightly better response in the UV and faster integration time; the HR4000 has an electronic shutter feature. The HR Series feature an onboard microcontroller that provides you considerable flexibility in controlling your spectrometer and accessories. Through its 30-pin connector, you can control the HR’s operating parameters and light sources, create processes and retrieve information on external objects. Ten user-programmable digital inputs/outputs allow you to interface with other equipment or a triggering device. The HR Series Spectrometers interface easily to a PC, PLC or other embedded controller via USB 2.0 or RS-232 serial port. Data unique to your spectrometer is programmed into a memory chip inside that is read by our spectrometer operating software – enabling hot-swapping between computers. transient events such as laser pulses. The QE65000 Spectrometer is the most sensitive spectrometer we’ve developed. Its Hamamatsu FFT-CCD detector provides 90% quantum efficiency as well as superior signal-to-noise ratio and signal processing speed. QE65000’s onboard programmable microcontroller puts you in command of the spectrometer and its accessories and provides 10 user-programmable digital inputs/outputs as well as a pulse generator for triggering other devices. The QE65000’s great quantum efficiency is not its only distinguish-ing feature. Its 2D area detector lets us bin (or sum) a vertical row of pixels. That offers significant improvement in the signal-to-noise ratio (>1000:1) performance and signal processing speed of the detector compared with a linear CCD, where signals are digitally added by an external circuit. Because the QE65000’s detector is back-thinned, it has outstanding native response in the UV. It’s an excellent option for low light-level applications such as fluorescence, Raman spectroscopy, DNA sequencing, astronomy and thin-film reflectivity. 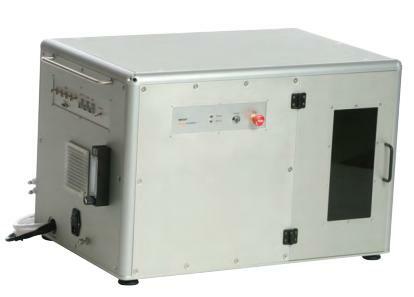 Its TE-cooled detector features low noise and low dark signal, enabling low light-level detection and long integration times from 8 ms to 15 minutes. At the heart of each Maya2000 Pro is a back-thinned 2D FFT-CCD detector – we offer two such detector options – in a robust, configurable optical bench with low-noise electronics and low-jitter triggering capabilities. Accessory and bench options allow users to optimize systems for setups ranging from the vacuum VUV (as low 165 nm) to the VIS-NIR (especially in the region <780 nm). 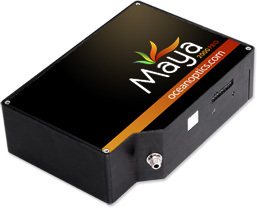 Maya2000 Pro Spectrometers are versatile. If your application demands great response at lower wavelengths – especially <300 nm – the Hamamatsu S10420 detector version is your best bet. For better sensitivity at longer wavelengths (>780 nm), we recommend the Hamamatsu S11510 detector version. Mix and match from a variety of gratings, slits and other accessories to maximize performance. Also, we offer an application-ready Maya system that is a good option for Raman and low light level applications where long integration times are not necessary. The Maya2000 Pro-NIR, is preconfigured with the S11510 detector, is optimized to 780-1180 nm and includes a longpass filter, 50 µm slit and gold mirrors for enhanced NIR sensitivity. 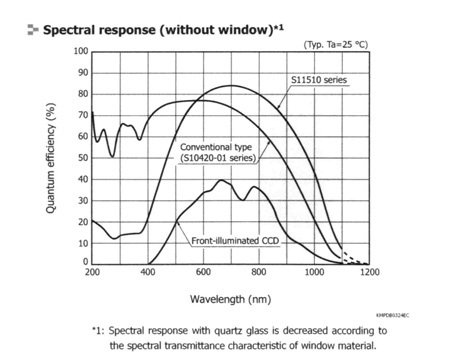 * For VUV applications, you will need a MAYA-DEEP-UV window for the spectrometer. Learn more about purging and other VUV setup requirements here. Here is spectral response data that Hamamatsu reports for its S10420 and S11510 FFT-CCD image sensors. Detector response represents just one element of spectrometer system response. System response combines the effects of all the elements of the instrument, including the optical bench design and grating choice. 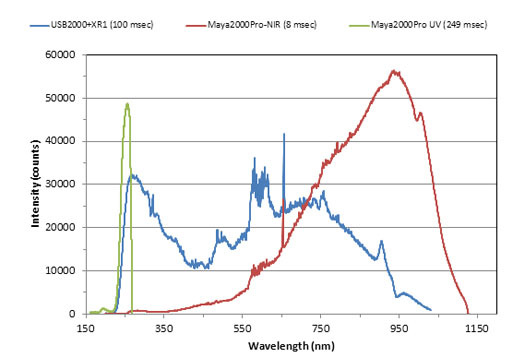 This graph shows the spectral response of Maya2000 Pro spectrometers configured with both UV-VIS (S10420) and VIS-NIR (S11510) back-thinned CCD detectors. Also, the graph includes spectral response of our USB2000+XR1, which has a front-illuminated CCD detector. In this setup, we measured the relative output of a miniature deuterium tungsten halogen source. A trifurcated optical fiber transmitted signal to the spectrometers, which were set to different integration times to keep within scale. Also, the Maya2000 Pro with S11510 detector required attenuation at the fiber to avoid saturation. 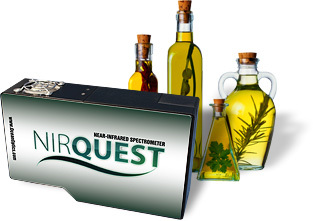 NIRQuest Near-Infrared Spectrometers deliver excellent performance, accuracy and reliability. These small-footprint spectrometers cover various ranges (depending on your configuration) from 800 – 2500 nm and are ideal for demanding applications ranging from moisture detection and chemical analysis to high-resolution laser and optical fiber characterization. Thanks to their low-noise optoelectronics and a range of grating and bench options, NIRQuest spectrometers can be customized for demanding applications in the lab and on the line. In addition, robust triggering functions provide accurate timing and synchronization between NIRQuest and other devices. Jaz is like nothing you’ve ever seen before — a community of stackable, modular and autonomous components that combine to create a family of smart sensing instruments. Jaz is unfettered by the limits of traditional optical sensing instrumentation. Its unique features and expandable platform makes it uniquely suited for field applications, remote sensing, process flow and quality assurance. Jaz is also available with an LED module that allows you to switch out LED bulbs much more easily. Now, instead of having to replace the entire module, all that’s necessary is to replace the LED assembly – a small fixture with just three screws to manage. We offer modules and bulbs for white LEDs and for 450 nm, 590 nm and 640 nm wavelength LEDs. Consult an Applications Scientist for details. Though the crossed Czerny-Turner optical bench design may be familiar, the rest of the bench is anything but conventional. For maximum flexibility, gratings and external slits are designed to be easily switched out by qualified users. Powerful onboard microprocessors eliminate the need for a PC while the OLED display offers clear, vivid viewing. 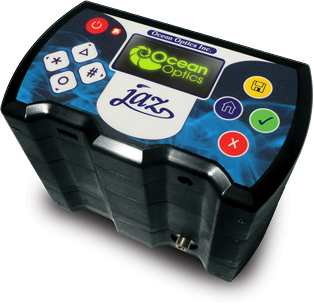 The Jaz OLED module is the user interface. 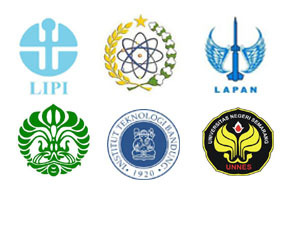 Its powerful microprocessor is the “director” harmonizing the interaction among the modules. The Jaz OLED module handles data processing and logging, distributed computing and user interface functions in the display. Ethernet supplies system power, makes remote access possible and provides memory and other functions. Our 100 Mb/S Ethernet connection is a “single-cable solution” that powers the system and enables remote access by any computer on the network. Communication can take place among modules that are plugged in anywhere on the World Wide Web. The module also includes an SD card slot for data storage. Rechargeable battery and data storage functions take the hassle of external power supplies and PC handling out of field work. Lithium-Ion battery is rechargeable from the main board via Ethernet, USB or external power supply and allows autonomous data collection with power-conserving sleep mode for long-term measurements. This module also has two SD card slots for memory and other functions. Jaz uses IP communications protocol; proprietary interface allows communications with stack and/or the backplane. Meet the new optical measurement system for absolute irradiance measurements of solar simulators and other radiant sources. The new RaySphere from Ocean Optics measures absolute irradiance over spectral ranges from the UV to the NIR (350 to 1700 nm). This portable system is ideal for solar simulator manufacturers and research and development labs as a tool to validate the output of installed solar flashlamps. The flash of a solar simulator is used within the photovoltaic (PV) manufacturing process for the binning of cells according to spectral response and for final PV module efficiency measurements. The RaySphere system delivers the accuracy and resolution needed to measure and analyze the performance and stability of the flasher with ultralow jitter triggering electronics for timing the measurement to the flashes. Calibration has been validated by an accredited certification lab to ensure accurate detection, enabling evaluation and qualification of the spectral distribution of solar flashers and simulators according to the IEC60904-9 (2007) standard. The system includes two thermoelectrically cooled detectors that perform repeatable and accurate spectral analysis of solar flashers from 350 to 1700 nm, and a second version contains a single cooled detector for measurement to 1100 nm. 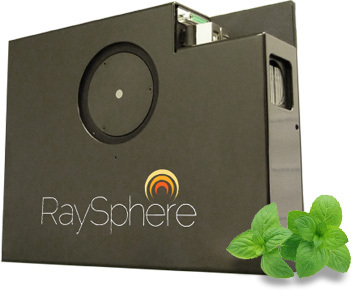 RaySphere includes high-speed electronics and an intuitive powerful software interface. Brief measurement times enable detection of a complete spectrum during a flash or even during a portion of the flash. The measurement can be triggered by a fast response photodiode that reacts on the increasing intensity of the flashlight with sub-microsecond response times. LIBS technology is a powerful tool for rapid, real-time elemental analysis. With LIBS, there is virtually no sample preparation, excellent portability, real-time results and sensitivity down to parts-permillion and picogram levels. identification of a comprehensive range of metal and gemological materials, as well as biological and chemical agents, hazardous materials and more. The application areas of LIBS are growing dramatically. From environmental monitoring to materials analysis and from forensics to pharmaceuticals, LIBS fits the bill when simple and straightforward techniques are required. The InsightTM LIBS System is designed for the microanalysis of solid materials. The standard spectrometer within the Insight provides a broad spectral range (190-960 nm) and better than 0.1 nm resolution throughout the system. Major and minor elements can be resolved and the 30,000+ points in a typical spectrum can be expanded to reveal lines separated by less than 0.2 nm in the UV range. The band of Ocean Optics spectrometers used in the Insight has excellent sensitivity to low-light levels enabling the spectral detection of trace elements. The LIBS2500plus Laser-induced Breakdown Spectrometer Measurement Systems are detection systems that permit real-time qualitative measurements of elements in solids, solutions and gases. These broadband, high-resolution systems provide spectral analysis across a wide 200-980 nm range (depending on the system) at a resolution of ~0.1 nm (FWHM). A high-intensity, pulsed laser beam is focused on the sample area, positioned a few centimeters to a meter from the sample. A single 10 nanosecond-wide laser pulse is all that is needed to excite the sample. When the laser is fired, the high-temperature of the laser creates plasma. As the plasma decays or cools (~1.0 µsec after the laser pulse), excited atoms in the plasma emit light of characteristic wavelengths distinct to the element. All elements emit in the 200-980 nm region. 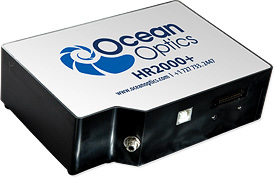 The detection systems use up to seven of our HR2000+ High-resolution Miniature Fiber Optic Spectrometers, each with a 2048-element linear CCD array. All spectrometers are triggered to acquire and read out data simultaneously. The detectors in the broadband (200-980 nm) LIBS2500plus collect the signal; software included with the system displays the data. 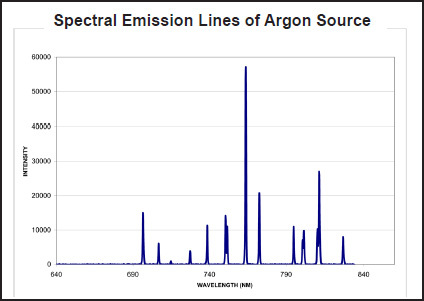 Most traditional LIBS detection systems have a small spectral range. 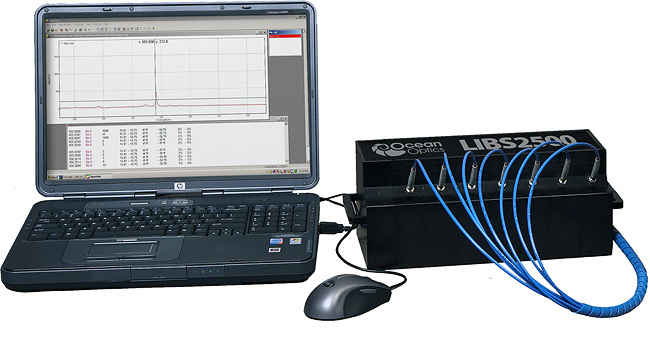 The LIBS2500plus Systems provide broadband spectral analysis. Because the systems are noninvasive, users can perform real-time measurements in situ, within hostile industrial, chemical and biochemical environments with little or no sample preparation. 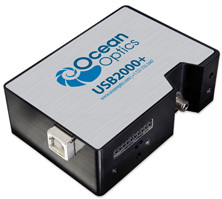 Since the LIBS2500plus utilizes Ocean Optics’ HR2000+ High-resolution Miniature Fiber Optic Spectrometers, the detection systems are portable and can be interfaced to a notebook PC via a USB port. 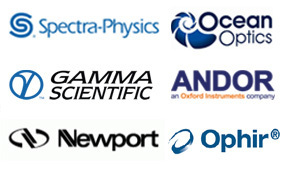 Ocean Optics offers a complete range of fully integrated Raman systems for handheld, laboratory and educational applications. Most of our Raman systems include a high-sensitivity spectrometer, a 532 nm or 785 nm laser, operating software and sampling accessories for probe or cuvette-based analysis. 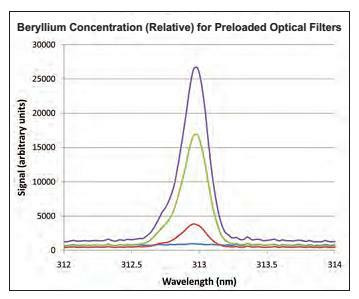 Raman analysis is nondestructive, requires very limited sample preparation, and allows for sample volumes in the microliter range. In fact, Raman techniques can be used to acquire data through vial walls, pill pack windows and bags – packaging forms that are frequently used in the biomedical and pharmaceutical industries. Our Raman spectrometers are especially useful for identifying spectral features, or fingerprints, that are often distinct and clearly separated. We offer off-the-shelf and modular approaches, sampling accessories for a variety of environments, cuvettes for solution measurements and a full range of probes for measuring solids and liquids.